With the midpoint of the NASCAR season just past us there has been enough drama, action, tears, wrecked race cars, poor TV coverage, poor track performance and a lot of name calling. Since unveiling the new points system it appears to be delivering all the drama it promised with close, position-swapping points races at the front of each of its three national series and just as much intrigue further back. It’s in the Cup Series, though, where winning has created a different dimension spawned by a format that reserves the last two positions in the Chase field for drivers with the most wins between 10th and 20th position in the standings. And whether it’s coincidental or not, 13 different drivers have visited Victory Lane this season and eight of those drivers currently sit in the top-10 in the standings. The drivers best positioned to claim the last two positions in the Chase field — albeit with eight races to go before the cutoff at Richmond in September — include David Ragan, who won at Daytona and Tony Stewart, who’s only two points behind 10th-place Denny Hamlin. Wins equal bonus points, and Kyle Busch and Kevin Harvick are deadlocked at 3 wins apiece and are locked into the chase. And Jeff Gordon and Matt Kenseth both have 2 wins. The list of winners this season has been shocking, amazing and refreshing to the sport. As intriguing as this year’s list of winners is, the list of non-winners is just as fascinating. With more than 40 career Cup wins between them, Dale Earnhardt Jr., Stewart, Bowyer and Greg Biffle have yet to visit Victory Lane in 2011. And that points to a critical element of NASCAR’s current car style — competitive parity. And it would be easy to paint Jimmie Johnson and team as the dominant force in the Cup Series, and given the fact that Johnson has mastered the Chase format to the tune of five consecutive championships, that wouldn’t be far from the truth. But that’s not been apparent this season. While Johnson has won once, his overall performance has only been adequate, marred at times by shortcomings on pit road. Hamlin put up a serious challenge to Johnson’s title run last season, but has just recently begun to resemble the squad that led the standings going into the 2010 Homestead finale. Four-time Cup Series champion Jeff Gordon, who’s already won twice this season, said the lack of a dominant driver this season was “a good question.” Although, Gordon thought that Edwards was the driver to beat at the beginning of the season and then mentioned Harvick, Johnson and Hamlin have being tough competitors as well. 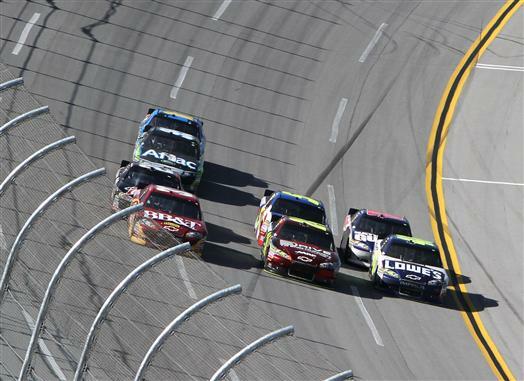 Other drivers, such as Kenseth, Johnson, Hamlin and Dale Jr., say that the playing field has been leveled out and it is anyone’s championship to win this year. With parity, there still exists the pressure to perform, and those on the fringes of the top 10 — or someone like Keselowski, who needs to stay consistent and get into the top 20 where even his one win might not be enough — know it. Earnhardt sure does. After residing in the top three earlier in the season, he fell to eighth after Kentucky — his third consecutive poor finish. Before a slide into pit road and a flat tire killed his chances of winning, Earnhardt wasn’t feeling too badly despite a growing winless streak. “We’re hanging in there — doing good,” Earnhardt said. “We started the season really good. We’ve struggled the last couple of weeks, but I had them kind of circled on my radar as weekends that might be hit or miss for us. So, hopefully we can get back on track and start putting together a couple of more good weeks and try our best to lock ourselves into the Chase.” So the big question here is: Does Dale Jr. make the Chase without a win? The next string of races could prove to be a wild ride for wild-card candidates. Indianapolis, Pocono and Watkins Glen have all favored Chase contenders Stewart, Hamlin, Bowyer, Joey Logano and Juan Montoya in recent years. All of them have won at least once. And to be in contention, drivers need to find a high level of consistency right up to race No. 26 at Richmond. Edwards recognized that when he wrecked and lost the points lead at Daytona. So the drivers have realized it’s time to put up or shut up because the drivers to make the Chase will be the 12 drivers running the best at that time of the season. Now this season has proven to be better competition but the television coverage has been spotty and not very good. FOX’s downside comes in their commentators, DW mostly, while TNT can’t even show a full green flag run without having at least two- five minute commercial breaks. TNT prides itself on having wide-open coverage and race fans only saw that briefly during Daytona and they tried something else for Kentucky and it failed too. ESPN and ABC are our last stops on the television coverage and ESPN has already made some changes that look to be for the better with making Alan Bestwick an anchor in the booth and fans seem to like this move for now. So with the midpoint behind us and the Chase knocking on the door who makes the Chase and who just races the rest of the season out for that 13th position?